Under orders, Paul grudgingly escorts Joseph, but quickly finds himself intrigued by the young man. As they make their way toward Juneau, it’s not just the need for warmth that drives them closer together. But neither man can draw an easy breath until they make it to the gold fields … and there’s no guarantee that Joseph’s brother will still be alive when they do. Personal Metals is set in the same time of Nobel Metals, although the characters are totally stand-alone. 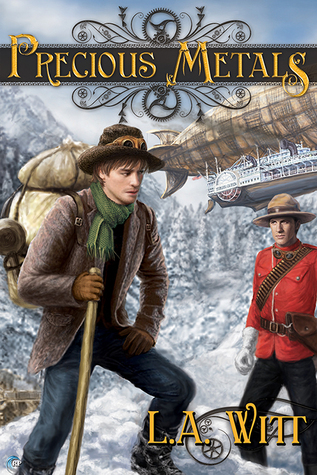 This time the focus falls into a mounted police Constable Paul Benson, who ends up accompanying young Joseph Starling to make their way from Chilkoot Pass to Juneau, in order to get to an airship so Joseph can save his little brother. If I have to compare with Nobel Metals, I will say that I like this one a little less. The thing is, while I thought the story was sweet – both characters were likeable and Joseph had this ingenuity of being a gay virgin, who never acted on his attraction/feelings towards men before – at the same time I also felt that it lacked conflict, either in the relationship or the threat to their lives. Oh, I’m not saying that their journey to Juneau was not dangerous. It was just that everything seemed to be resolved quite quickly, and not once did it keep me on the edge of my seat (or bed, since I actually read this in bed). But it indeed flew through nicely along the sweet spectrum…since the story was written from both Paul’s and Joseph’s perspectives, you would get the feel of both men. I admired Joseph; here is a man who didn’t let his fake leg stop him from anything, including going on a dangerous journey to save his brother. Hats off to him!! By the way, if you count the days of Paul and Joseph together, you could say that the relationship was pretty fast. But considering the situation that they were in, I didn’t really think of it immediately as instant love. The steampunk element was quite light – there were mechs and airships, but not exactly taking over the story from the relationship, so if one who is not very much into steampunk will still be okay with this. However, I think a reader would definitely get the better feel of the how the mechs work if they have read Noble Metals. This entry was posted on November 4, 2014 by Ami in Historical, Reviewer: Ami and tagged 3.5 Stars, klondike gold rush, la witt, riptide, steampunk.